City of Helsinki is one of the forerunners in open data but also in testing and implementing Internet of Things (IoT) solutions. This became clear at the Helsinki Loves Developers meetup organised at Kalasatama Urban Lab in Helsinki on 7th March 2019. During this open event the participants got a great overview to the ongoing projects regarding IoT, sensors and 5G. The key actor and driver behind these projects is Forum Virium Helsinki (FVH), the fully city-owned innovation and foresight company. 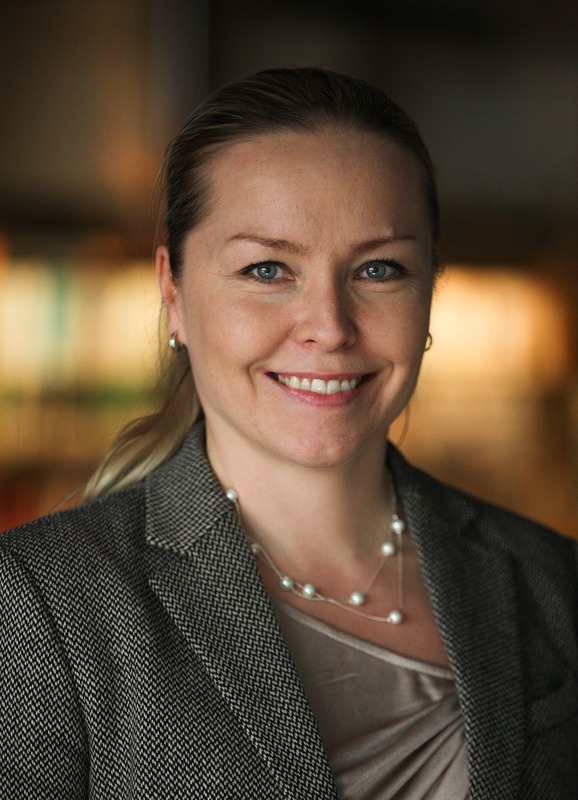 A new technology catalog provides useful information for developers told Hanna Niemi-Hugaerts, the director of IoT at FVH. Hanna Niemi-Hugaerts, the director of IoT at Forum Virium Helsinki, emphasized that FVH supports Helsinki to be the most functional city in the world. In practise FVH is building together with the city, several partners and pilot companies an open modular data ecosystem where both the city and third-parties can create value for our society through data. Currently FVH has 11 ongoing IoT projects which are focusing on e.g. digital single market, pre-commercial procurement, validating the market and capacity building and training. The ultimate aim is to develop data-enabled smart cities where data, whether open, closed or mydata, can create value for both individuals and society. Hanna also marketed Forum Virium Helsinki´s new technology catalog which is now available in Finnish but soon also in English. Natalia Reen, Tech Lead of IoT projects at FVH, presented the Select for Cities project. This project is helping cities and companies to co-create Internet of Everything platforms through pre-commercial procurement. Natalia told that the main challenges addressed by the project is the IoE progress to date has been slow due to a number of barriers. The barriers are e.g. the lack of common standards, a fragmented marketplace and lack of ways to systematically test and introduce new solutions in the cities. The goal of Select is to develop an open, standardized, data-driven, service-oriented and user-centric platform for European cities that enables large-scale co-creation, testing and validation of urban IoE applications and services and to approach cities as linked and large-scale Internet of Everything (IoE) labs. In Helsinki the project is especially focusing on air quality data and expected outcomes are e.g. pollution models, mobile apps for more healthy routing and sensor network planning tools. 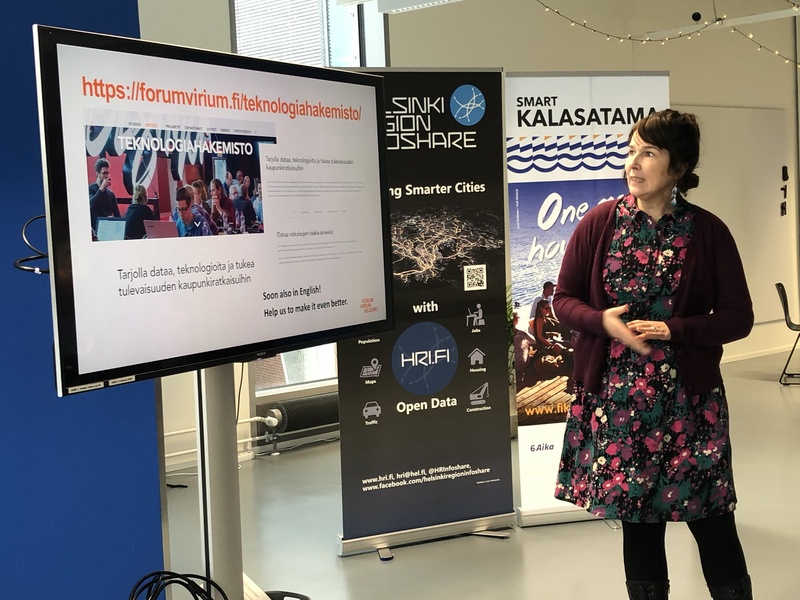 Veli Airikkala, Project Planner at FVH for IoT projects, presented H2020 funded bIoTope, a project that created an open innovation ecosystem that provides easy and low cost solutions for connecting smart objects and seemingly unconnected IoT systems. The project finds solutions for a mostly unstandardized industry where development happens in silos preventing co-creation and setting artificial bottlenecks for progress. The Helsinki pilot, as part of the international project, tackled issues regarding Smart Mobility and Smart Buildings linking the two domains into one holistic approach. Aapo Rista and Aki Salminen, IoT experts from Forum Virium Helsinki, had a brief Vekotinverstas (Gadget workshop) presentation and exciting real-time particulate matter demonstration. They used dry soil dust to demonstrate road dust (a common problem in Finland during spring time) and burned a piece of paper to demonstrate particles from exhaust fumes and wood burning. Data flowed fluently from sensors to a cloud server and from there to the screen in the front of audience. Juha Nummila, the Project Manager at FVH, presented the project called SynchroniCity, the European IoT Large Scale Pilot for Smart Cities and Communities. The SynchroniCity project aims to promote the international IoT markets for which companies can develop digital solutions. The project held an open funding call for SMEs to test their smart city solutions using IoT technology and to scale them to suit new markets. SynchroniCity selected 16 new pilots that will be deploying their IoT solutions in a total of 18 cities. In Helsinki there will be four pilots collecting and utilising especially air-quality data. Eero Jalo, the Project manager at FVH, explained how the UIA HOPE project supports to become a data source for data-driven air quality interventions. The project has recruited test users for three districts in Helsinki. 300 people wanted to join and measure air quality data with portable, low-cost sensors connected to their smart phones. The sensors are monitored by the University of Helsinki. Eero Jalo also presented UrbanSense and some useful 5G networks like LoRA and NB-IoT which are available for developers to demo. These kind of solutions support to transfer huge data masses quickly with very low latency. Leo Salomaa, the founder of Arcventure, has done good cooperation with Stara, Helsinki City Construction Services. Together they have tried to estimate the amount of street dust by utilising the information how and when the city has prevented slippery conditions on the streets. Stara has also successfully implemented Reboot the City project. Aapo Rista and Aki Salminen presenting the concept of Vekotinvertas to the Helsinki Loves Developers audience at Kalasatama Urban Lab. 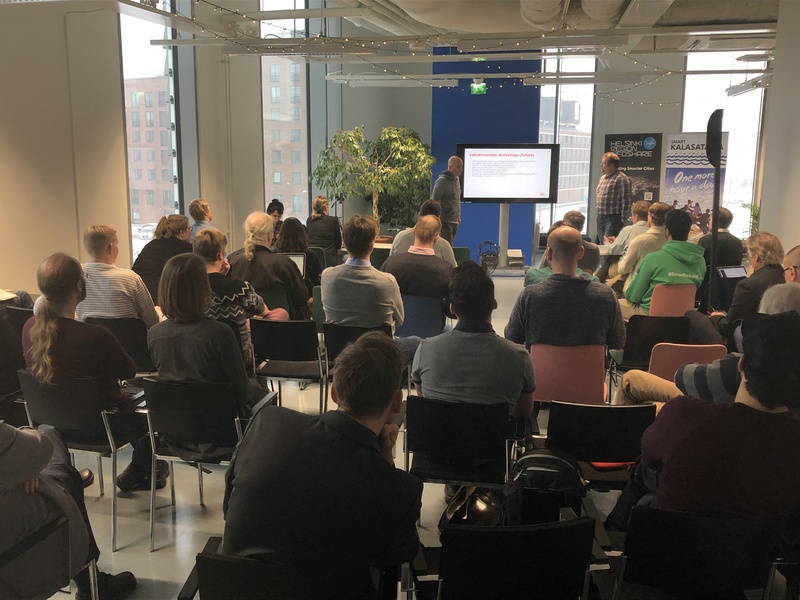 The event was organised at the Kalasatama Urban Lab and the room was full of developers and other active people during this event – thank you all for your contribution! The event was also live-streamed and recorded on Facebook: first part and second part. Kalasatama Urban Lab is a perfect venue for having an open dialogue and boosting the smart city development between the City, citizens, developers and companies. The venue is located in new smart Kalasatama district where different stakeholders have already tested their smart city solutions in real urban environment. Big thank for all speakers and participants!